Draft: 2002, Toronto Blue Jays, 29th rd. Wife's name is Sarah.....the couple has two sons, Brayden and Ethan, and a daughter, Avery ... Graduated from Christopher Dock (PA) High School, where he also played soccer ... Earned a bachelor's degree in business administration from Eastern Mennonite (VA) University ... Batted .415 with 33 HR and 159 RBI during his four-year collegiate career ... Contributed to the build of a new elementary school in Harrisonburg, VA, in 2018 ... Enjoys golf and spending time with his kids.....follow him on Twitter (@ErikKratz31). Was traded by New York-AL to Milwaukee on 5/25 in exchange for a player to be named or cash.....the deal was completed on 6/16 after INF Wendell Rijo was sent to the Yankees ... Batted .269 with 4 HR and 6 RBI in 17 games at Triple-A Scranton/Wilkes-Barre prior to the trade.....did not play for the Yankees ... Batted .236 with 6 HR and 23 RBI in 67 games with Milwaukee ... Made 54 starts, all at catcher.....the team went 33-21 in his starts ... The team had a 3.42 ERA when he caught (491.2ip, 187er) ... Threw out 13 of 44 runners attempting to steal (29.5%) ... Pitched on 6/30 at Cincinnati, 7/22 vs. Los Angeles and 8/2 at Los Angeles.....now has 5 career pitching appearances ... Batted .292 (7-for-24, 0hr, 3rbi) in 9 games during the postseason ... Became the oldest position player (38 years, 112 days) to make his postseason debut since Jose Morales (38 years, 278 days) with Los Angeles in 1983.....is the second-oldest position player to start in a postseason debut, behind Lave Cross (39) with Philadelphia-AL in 1905 ... Signed a 1-year contract on 11/27, avoiding arbitration. In four games with the Yankees, went 2-for-2 with 1 double and 2RBI…started the season with Triple-A Columbus, hitting .270/.359/.472 (76-for-282) with 38R, 16 doubles, 1 triple, 13HR, 37RBI and 32BB in 86 games…caught 25-of-67 (37.3%) attempted base stealers…was acquired by the Yankees from Cleveland in exchange for cash considerations on 8/31…was signed to a Major League contract and selected to the Yankees' active roster from Triple-A Scranton/Wilkes-Barre on 9/1…did not play in his ﬁrst eight games with the club…made his Yankees debut in 9/10 win at Texas, pinch-hitting for Sánchez in the ninth and hitting a two-run double. Went to camp with the San Diego Padres, spent time in the Houston, LA Angels, Pittsburgh Pirates and Toronto Blue Jays organizations during the campaign...Was a member of the Astros Opening Day roster after being acquired late in spring training camp from the Padres...Made pitching appearances for Houston on April 26 at Seattle and for Pittsburgh on June 21 vs. SF (only player since 1879 to pitch and catch with two different teams in a season)...Combined on the year appeared in 33 Major League games with the Astros and Pirates...Ended the season on the AAA Buffalo Bisons roster in the Blue Jays organization. Split the season between the Royals organization and Phillies, also missing time with a stint on the 15-day DL...Made the Royals Opening Day roster...15-day DL on 5/6 with plantar fascitis in his left foot… Reinstated from the DL after a rehab assignment and was designated for assignment on 6/11...After brief stint with Boston signed as a minor league FA w/Seattle...Spent Sept. with the Phillies. Erik joined the Royals on July 28 in a trade that sent infielder Danny Valencia to Toronto (KC also received RHP Liam Hendriks)...Hit .276 (8-for-29) with a double, two homers and three RBI in 13 games with KC, serving as the backup catcher...Recorded his first career multi-home run game on August 18 at Target Field with a pair of solo shots…Entered the game as a pinch-hitter for an injured Salvador Perez in the seventh inning, homering on the first pitch...Became the first Royals player to homer as a pinch hitter and then homer again in the same game...Batted .333 (8-for-24) with a double, two home runs and three RBI in August…Batted .281 after the All-Star break...Went 11-for-19 (.579) with three home runs and 9 RBI on the first pitch of an at-bat...Opened the year with Toronto and spent the first two weeks with the Jays, before being optioned in mid-April...Recalled on May 2...Hit a two-run homer against his former team, Philadelphia, on May 7, which was also his first multi-hit game of the season. Made his first Opening Day Roster. Appeared in 68 games for the Philadelphia Phillies. Missed over a month of the season due to left knee surgery. Collected RBI in 12 of 13 contests from May 24-June 7. Had career-highs in games (68), at-bats (197), runs (21), hits (42), walks (18) and strikeouts (45). Made one error in 441 total chances for a .998 fielding percentage. Shuttled between the Phillies and Lehigh Valley (AAA) allseason; had 5 call-ups... His ML stints: 5/2-11 (Jim Thome DL'd); 5/22-23 (JimmyRollins on paternity leave); 5/29-6/3 (Roy Halladay DL'd);6/16-19 (B.J. Rosenberg optioned); 6/25-remainder ofthe season (Brian Schneider DL'd)... Slugged his 1st ML HR (pinch), 5/22 vs WSH (TomGorzelanny)... Scored the winning run as a pinch runner on a sacrificefly, 7/23 vs MIL... Hit a 9th-inning, game-tying HR off Craig Kimbrel, 8/31at ATL; it was the 1st HR Kimbrel had ever allowed on a0-2 count... 18 of his 35 ML hits (51.4%) went for extra bases (9 2B, 9 HR)... Started 25 of 32 games while Carlos Ruiz was on the DL;overall, made 38 starts for the Phillies... Hit safely in 23 of his 38 starts (.252, 33-131)... The Phillies went 23-15 (.605) in his 38 starts... Caught 12 of 30 (40.0%) potential base stealers. Spent the entire season with Lehigh Valley (AAA) and set professional highs in hits (103), HR (15) and RBI (53). ... Named to the International League All-Star team; his third consecutive All-Star selection. ... Led the team and finished 3rd among IL catchers in AVG (.288). ...Threw out 23 of 76 potential basestealers (30.3%). ... Appeared in 7 IL playoff games. ... Had his contract selected on 9/17 following the conclusion of Lehigh Valley's season. ... Made one start for the Phillies: 9/20 vs WSH (gm 1), and collected his 1st ML extra-base hit (double). Spent entire season with Triple-A Indianapolis and earned International League mid-season and post-seasonAll-Star honors...Received the Top Star Award for the International League as the All-Star Game MVP after going 2-for-2 with a walk,double and two-run homer in the International League's 6-5 win over the Pacific Coast League...Was named Indianapolis' DefensivePlayer-of-the-Year...Threw out 25-of-58 runners attempting to steal against him (30%), which ranked fifth among International Leaguebackstops...Led all International League catchers in home runs and RBI...Made a career-high 91 appearances at catcher...Hit .340 (33-for-97) against lefthanders and .243 (54-for-222) against righties...Recorded seven stolen bases after entering the year with a totalof six in 462 career games...Hit first home run on 4/21 at Toledo...Had 11 of his 21 hits go for extra bases (10 doubles and onehome run) during the month of May...Hit .216 (11-for-51) in July before bouncing back to hit .329 (23-for-70) with nine doubles,five home runs and 16 RBI in 19 games during the month of August...Made first of two defensive appearances at first base on 7/22(also on 9/6)...Was charged with four errors in his first 39 games but just two over his last 54 games...Played for Aguilas in theDominican Winter League and went 2-for-31 with four RBI in 16 games. Split season between New Hampshire (Blue Jays' AA) and Syracuse (Blue Jays' AAA) - his third straightseason with those two clubs...Hit .239 with 16 home runs and 43 RBI in 73 total games...Began season with New Hamsphire, wherehe made 19 appearances behind the plate, four at first base and two at third base...Also went 6-for-27 (.222) with three homeruns in eight games as the designated hitter...Hit .270 (10-for-37) in 10 games before being promoted to Triple-A on 5/3...Went4-for-34 (.118) in first nine games with Syracuse before hitting safely in 13 of his 16 games from 5/22 thru 6/9 (21-for-59, .356)and raising average to .275...Tallied second career triple on 5/23 at Norfolk...Homered twice on 6/2 vs. Norfolk...Went deep inback-to-back games on 6/5-6 and again on 6/9-10...Homered six times in a seven-game stretch from 6/2-10...Hit .263 with sixhomers and 14 RBI in 16 Triple-A games during the month of June...Returned to Double-A on 6/22 and made one appearancewith New Hampshire before returning to Syracuse...Played final Triple-A game on 7/21...Made 39 appearances at catcher and oneat first base while playing with the Chiefs...Also made fourth career pitching appearance on 6/26 vs. Toledo and retired the threebatters he faced...Homered in first game upon return to Double-A on 7/26 at Reading...Picked up 10 RBI and hit four home runsin 16 games in August. Played his first full season at the AA levelwith New Hampshire of the Eastern League... Batted .205with 10 doubles, 11 home runs and 34 RBI in 91 games(89-C, 2-DH)... Finished 4th on the team in home runs, 5th inwalks (27) and 6th in RBI... Had his best month in April,when he batted .279 with two home runs and eight RBI in 15games... Had 12 multi-hit games... Selected by the BlueJays to participate in the Arizona Fall League... Played forthe Peoria Saguaros... In 16 games, batted .192 (5-26) withthree doubles, eight runs scored and two RBI. March 24, 2019 Milwaukee Brewers traded C Erik Kratz to San Francisco Giants for SS C.J. Hinojosa. May 25, 2018 New York Yankees traded C Erik Kratz to Milwaukee Brewers for Future Considerations. February 2, 2018 C Erik Kratz assigned to Scranton/Wilkes-Barre RailRiders. 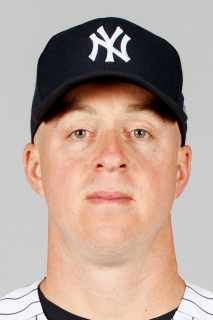 December 7, 2017 New York Yankees signed free agent C Erik Kratz to a minor league contract and invited him to spring training. November 2, 2017 C Erik Kratz elected free agency. October 22, 2017 New York Yankees activated C Erik Kratz. October 3, 2017 New York Yankees reassigned C Erik Kratz to the minor leagues. September 1, 2017 New York Yankees selected the contract of C Erik Kratz from Scranton/Wilkes-Barre RailRiders. August 31, 2017 Cleveland Indians traded C Erik Kratz to New York Yankees for cash. August 31, 2017 C Erik Kratz assigned to Scranton/Wilkes-Barre RailRiders. December 1, 2016 Cleveland Indians signed free agent C Erik Kratz to a minor league contract and invited him to spring training. December 1, 2016 C Erik Kratz assigned to Columbus Clippers. November 7, 2016 C Erik Kratz elected free agency. July 29, 2016 C Erik Kratz assigned to Buffalo Bisons. July 28, 2016 Toronto Blue Jays signed free agent C Erik Kratz to a minor league contract. July 22, 2016 Pittsburgh Pirates sent C Erik Kratz outright to Indianapolis Indians. July 19, 2016 Pittsburgh Pirates designated C Erik Kratz for assignment. June 11, 2016 Los Angeles Angels traded C Erik Kratz to Pittsburgh Pirates for cash. May 27, 2016 Los Angeles Angels signed free agent C Erik Kratz to a minor league contract. May 27, 2016 C Erik Kratz assigned to Salt Lake Bees. May 22, 2016 Houston Astros released C Erik Kratz. May 16, 2016 Houston Astros designated C Erik Kratz for assignment. March 28, 2016 Houston Astros traded RHP Dan Straily to San Diego Padres for C Erik Kratz. December 19, 2015 C Erik Kratz assigned to El Paso Chihuahuas. November 8, 2015 San Diego Padres signed free agent C Erik Kratz to a minor league contract and invited him to spring training. October 9, 2015 C Erik Kratz elected free agency. October 7, 2015 Philadelphia Phillies sent Erik Kratz outright to Lehigh Valley IronPigs. September 1, 2015 Philadelphia Phillies selected the contract of Erik Kratz from Lehigh Valley IronPigs. July 20, 2015 C Erik Kratz assigned to Lehigh Valley IronPigs. July 17, 2015 Philadelphia Phillies signed free agent C Erik Kratz to a minor league contract. July 15, 2015 Tacoma Rainiers released C Erik Kratz. July 2, 2015 Seattle Mariners signed free agent C Erik Kratz to a minor league contract. July 2, 2015 C Erik Kratz assigned to Tacoma Rainiers. June 29, 2015 C Erik Kratz elected free agency. June 28, 2015 Boston Red Sox sent Erik Kratz outright to Pawtucket Red Sox. June 25, 2015 Boston Red Sox designated C Erik Kratz for assignment. June 23, 2015 Boston Red Sox activated C Erik Kratz. June 21, 2015 Boston Red Sox claimed C Erik Kratz off waivers from Kansas City Royals. June 11, 2015 Kansas City Royals designated C Erik Kratz for assignment. June 11, 2015 Kansas City Royals activated C Erik Kratz from the 15-day disabled list. May 21, 2015 Kansas City Royals sent C Erik Kratz on a rehab assignment to Omaha Storm Chasers. July 22, 2014 Toronto Blue Jays optioned C Erik Kratz to Buffalo Bisons. July 9, 2014 Toronto Blue Jays recalled Erik Kratz from Buffalo Bisons. June 23, 2014 Toronto Blue Jays optioned C Erik Kratz to Buffalo Bisons. May 14, 2014 Toronto Blue Jays recalled Erik Kratz from Buffalo Bisons. May 12, 2014 Toronto Blue Jays optioned C Erik Kratz to Buffalo Bisons. May 2, 2014 Toronto Blue Jays recalled Erik Kratz from Buffalo Bisons. March 30, 2014 Toronto Blue Jays recalled Erik Kratz from Buffalo Bisons. March 28, 2014 C Erik Kratz loaned to Buffalo Bisons from Toronto Blue Jays. March 26, 2014 Toronto Blue Jays optioned C Erik Kratz to Buffalo Bisons. December 3, 2013 Toronto Blue Jays traded RHP Brad Lincoln to Philadelphia Phillies for C Erik Kratz and LHP Rob Rasmussen. July 14, 2013 Erik Kratz roster status changed by Philadelphia Phillies. July 13, 2013 Philadelphia Phillies sent C Erik Kratz on a rehab assignment to Reading Fightin Phils. July 8, 2013 Philadelphia Phillies sent C Erik Kratz on a rehab assignment to Lehigh Valley IronPigs. June 9, 2013 Philadelphia Phillies placed C Erik Kratz on the 15-day disabled list. Injured left knee. June 25, 2012 Philadelphia Phillies recalled Erik Kratz from Lehigh Valley IronPigs. June 20, 2012 Philadelphia Phillies optioned Erik Kratz to Lehigh Valley IronPigs. June 16, 2012 Philadelphia Phillies recalled Erik Kratz from Lehigh Valley IronPigs. June 4, 2012 Philadelphia Phillies optioned Erik Kratz to Lehigh Valley IronPigs. May 29, 2012 Philadelphia Phillies recalled Erik Kratz from Lehigh Valley IronPigs. May 24, 2012 Philadelphia Phillies optioned Erik Kratz to Lehigh Valley IronPigs. May 22, 2012 Philadelphia Phillies recalled Erik Kratz from Lehigh Valley IronPigs. May 12, 2012 Philadelphia Phillies optioned Erik Kratz to Lehigh Valley IronPigs. May 2, 2012 Philadelphia Phillies recalled Erik Kratz from Lehigh Valley IronPigs. March 29, 2012 Philadelphia Phillies optioned Erik Kratz to Lehigh Valley IronPigs. October 10, 2011 Erik Kratz roster status changed by Philadelphia Phillies. September 30, 2011 Philadelphia Phillies reassigned C Erik Kratz to the minor leagues. September 17, 2011 Philadelphia Phillies selected the contract of C Erik Kratz from Lehigh Valley IronPigs. September 8, 2011 Erik Kratz roster status changed by Lehigh Valley IronPigs. August 31, 2011 C Erik Kratz suspended. April 2, 2011 C Erik Kratz assigned to Lehigh Valley IronPigs. November 19, 2010 Philadelphia Phillies signed free agent C Erik Kratz to a minor league contract and invited him to spring training. November 6, 2010 C Erik Kratz elected free agency. September 10, 2010 Pittsburgh Pirates sent C Erik Kratz outright to Indianapolis Indians. September 7, 2010 Pittsburgh Pirates designated Erik Kratz for assignment. August 7, 2010 Pittsburgh Pirates optioned C Erik Kratz to Indianapolis Indians. July 16, 2010 Pittsburgh Pirates selected the contract of Erik Kratz from Indianapolis Indians. January 4, 2010 Pittsburgh Pirates invited non-roster C Erik Kratz to spring training. December 25, 2009 C Erik Kratz transferred to Tigres del Licey from Aguilas Cibaenas. November 12, 2009 Erik Kratz assigned to Aguilas Cibaenas. April 8, 2005 C Erik Kratz assigned to New Hampshire Fisher Cats.